After the tragedy in Invermoriston there was to be no more hiking in our futures. We were unable to finish hiking the Great Glen Way all the way to Inverness, but we still had accommodations along the way. We took cabs instead, and still got to experience the beauty and history of the highlands without the hiking aspects. The good news is, we have an excuse to go back!! From Invermoriston we took a cab up to Drumnadrochit, where were told, the villagers had already heard all about the man with the sore leg. 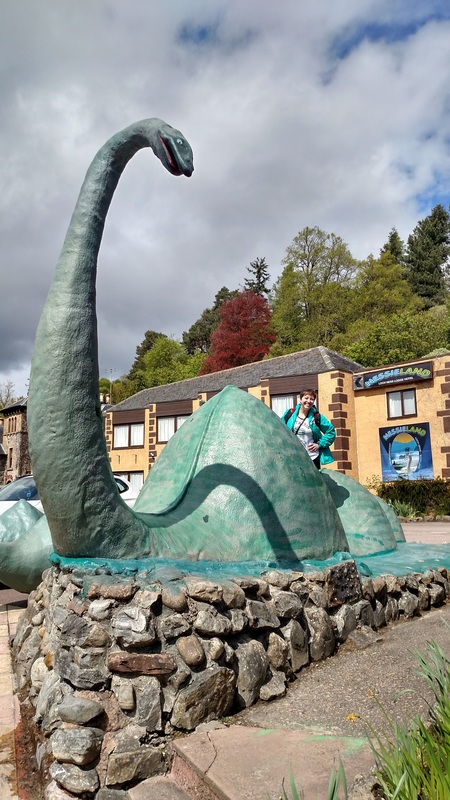 Not to be totally hobbled by his accident and to his credit, Charles managed to limp around town to attractions and sites, and we had a whole day to explore the traditional home of Nessie, the Loch Ness Monster. We started our time in Drumnadrochit with a ride around Loch Ness on Nessie Hunter. 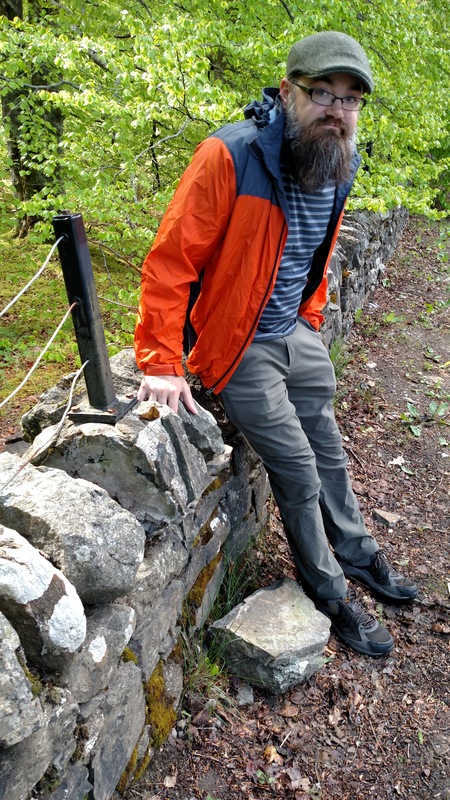 Our guide himself claims to have seen something unexplained in the water, and we also got to learn about the history of the area, the geography and geology, and folklore surrounding Nessie. The guide also pleasingly sounded just like Sean Connery. Back on dry land we headed to the shops to stock up on Nessie gear. In addition to the exploring and good food, we also had a lot of time to experience the awesomeness that is British television. 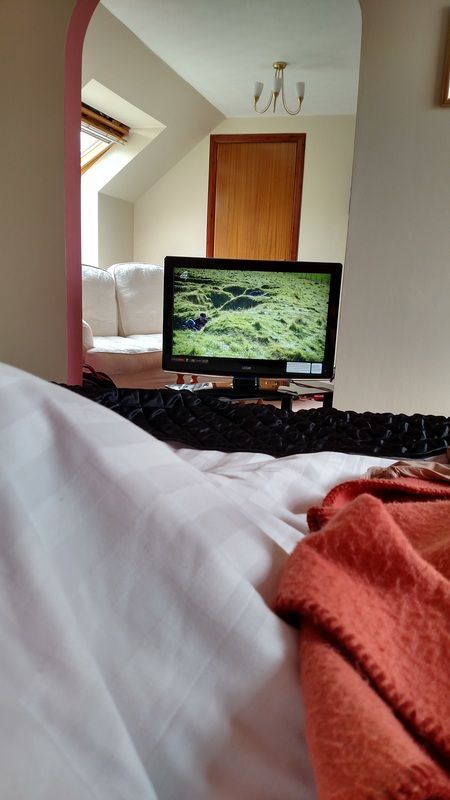 From the shocking (to our US sensibilities) Embarrassing Bodies, to vet shows, to cop shows, and the Benedict Cumberbatch version of Richard III and my favorite, Time Team, we had plenty of telly time. Our second day in Drumnadrochit was rainy and perfect for TV times and snacks and hot chocolate and leg recuperation. The next day was our final leg (ahahahahaha) of the Great Glen Way, and we arrived in Inverness not in a triumph having completed the 70+mile hike but instead limping out of a cab. 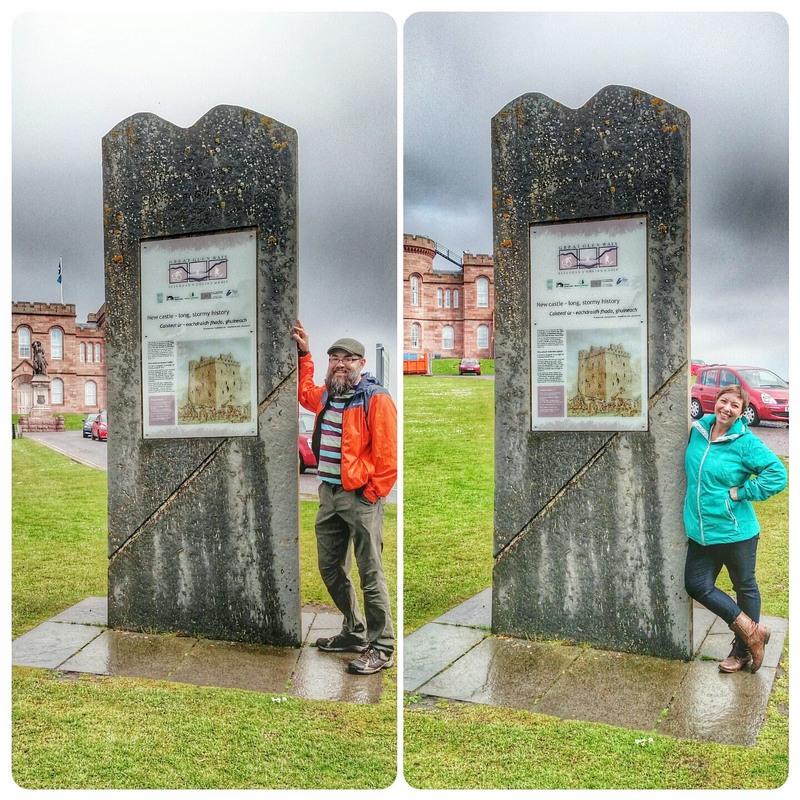 We still took a picture with the Great Glen Way sign, because one way or another, we traveled it all. I got a Cafe Nero fix, and we explored the town as best we could. Our last B&B on the trip, Inverglen Guest House, was a delight, and I’m still thinking about the chai muffins we had for breakfast there, Susan. Our last full day in the Highlands, I booked a day trip to the Isle of Skye, since everyone we know who had been to Scotland said we couldn’t miss it. As I was reading the description of the tour the night before, I noticed we would make a stop in Invermoriston to see the Telford bridge and falls. Charles was not as please, but I was thrilled to have a chance to revisit the scene of the crime and get some more photos. From Invermoriston (again), we headed west to the Isles of the Highlands. What a simply breathtaking area. All of our friends were right. 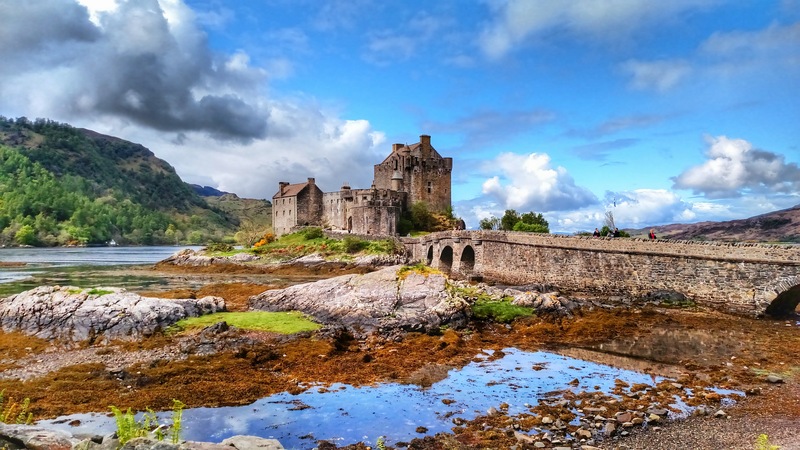 We stopped at Eilean Donan castle by Kyle of Lochalsh, which is one of the most picturesque and most photographed castles in Scotland. Along the road to the Isle of Skye we saw Wild Goats, which if you know anything about me, completely made my trip. 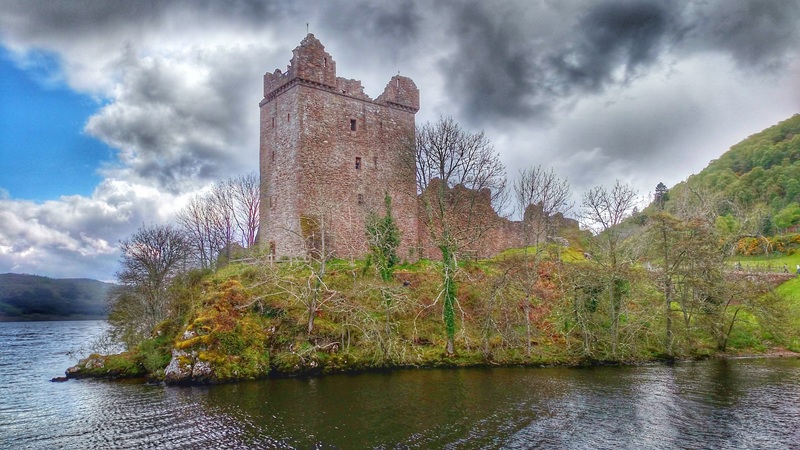 A tour around the island, a stop in Portree for snacks and souvenirs, and before we knew it we were back on the road to Inverness. On our last morning, we explored Inverness one last time, and found the famous Leakey’s Bookshop and a few charity shops. At a shopping centre I came across a music store and impulse bought a practice chanter so I can learn to someday play the bagpipe. Or just stick to the chanter to the delight of my dog and cat who LOVE to sing along… so far I can play the Skye Boat Song (Outlander Theme), a few Christmas songs, and the Olympic Theme (which I played at every opportunity last summer. Everyone loved it). 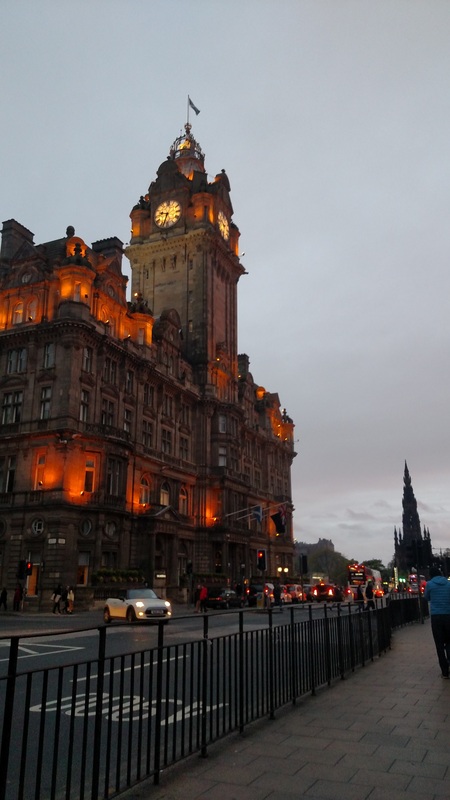 After a few hours on the train we were back in Edinburgh where we had a chance to explore more of New Town since our previous visit had confined us to Old Town and the Royal Mile. A Sainsbury’s run for tea and Mars Bars and Toffee Crisps, one last tea experience, last souvenirs bought, and it was back on a plane to the US before we knew it. It was a fantastic trip and everything we could have imagined. The leg injury turned out to be a boon; because of it, I’ve managed to convince Charles that his mistake was going to cost him (us) another trip! Next week we head back to Scotland, with a side tour in Ireland, to wrap up the Great Glen Way. From Fort Augustus to Inverness, we will do the last half of the hike and truly earn our GGW hiking patch and certificate. Bon voyage! 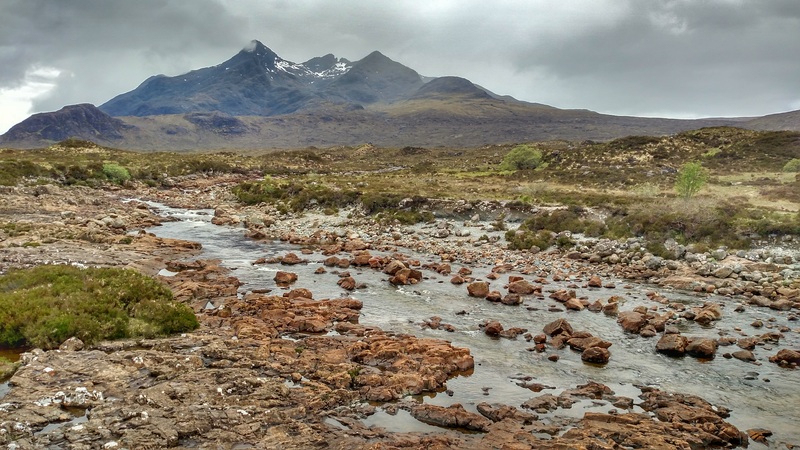 ← Scotland 2016: The Tragedy, the NHS, and the kindness of Highlanders.